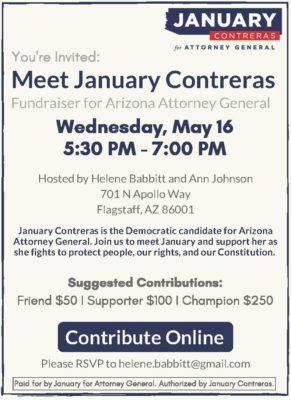 January Contreras is running unopposed in the Democratic primary but she will face a tough battle against the Republican incumbent Arizona Attorney General. There is no one better equipped to beat him and to serve the people of Arizona in this important post. Come to Ann Johnson’s home to meet January and contribute to her campaign.